I fell behind on the Picture Book Reading Challenge during April, but I'm catching up in May! 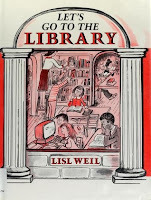 Here are my reviews for #18 a book celebrating libraries or reading (Let's Go to the Library), #44 a book published in the 1950s (The Giant Story), #71 a book about dinosaurs OR dragons (Every Day a Dragon), #75 a book that makes you cry (Do You Know What I'll Do? 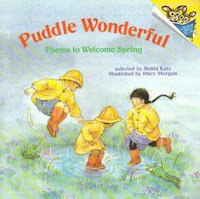 ), #86 a poetry book (Puddle Wonderful), and #93 a book about celebrating birthdays (The Birthday Party). 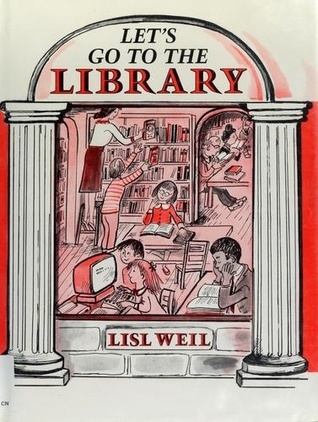 Let's Go to the Library was published in 1990, but its two-toned illustrations have a wonderful vintage feel. I'm sure some readers (and librarians who have weeded the book) feel that it looked outdated when it was published and looks even more so now, but both my husband and I were drawn to it precisely because it looks older. The content is impressive. Some of the technology mentioned is a little behind the times (microfilm, for example) but the overall mission of libraries as providers of information comes across very clearly. There is also a good amount of history packed into the book, which helps contextualize libraries in our culture, and in our world. I have read a lot of kids' books about what librarians do, and compared with some newer titles, this one is better written and less preachy. 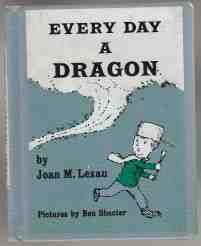 We have been collecting a lot of Maurice Sendak books recently. In going over the list of his books on Goodreads, my husband discovered this story by Beatrice Schenk de Regniers which just happened to be available to read from Open Library. 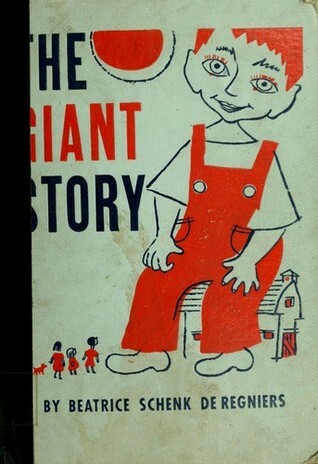 The story is about a boy who spends his whole day pretending to be a giant who can crush people's houses and eat the leaves from trees. Miss Muffet is really into giants right now - fighting them off, painting pictures of them, imagining that one comes at night to bite her thumbs - so I shared this with her. She told my husband she didn't like it, but the look of joy on her face as I read betrayed her true feelings. It was a definite case of right kid, right book, right time. Every Day a Dragon is a story about a father and son who play a game of make-believe every afternoon. When Dad arrives home, he pretends to be a dragon, and the boy hides from him to avoid being eaten. At the end of the night, the boy heads to bed so he can get a good night's sleep and have enough energy to fight the "dragon" again the next day. This is the perfect book for imaginative preschoolers. The illustrations by Ben Shecter (complete with a saucepan upside-down on the boy's head) perfectly match the mood of the story. It reminds me a lot of newer books like Mitchell's License and Daddy Makes the Best Spaghetti, which also focus on fun father-son dynamics. In Do You Know What I'll Do? a big sister talks to her little brother about the things they will do together, and the ways she will take care of him. I'm not sure this would have made me cry before I was a parent, but with all the talk in our house lately about being big sisters, it struck a pretty big chord. I'm a little disappointed that this book has been re-illustrated in recent years. Garth Williams was a brilliant illustrator and I find it disrespectful when publishers discarded allegedly "outdated" pictures and allow a new illustrator to reinterpret the text. I much prefer to read original versions. Because of our love for poetry picnics, we have quite a few poetry collections. I'm not sure how this Pictureback book came to be in our possession (it may have been mine or my sister's in childhood?) but it's a heavily illustrated collection of surprisingly scholarly poems for kids, including works by E.E. Cummings, Langston Hughes, John Updike, etc., as well as poems by kids' authors like Jack Prelutsky. We read it cover to cover one night at the dinner table, and I think I will take it along on our next poetry picnic since it is so portable compared to some of our larger tomes, and the illustrations are very preschool-friendly. This was another Goodreads discovery that was available on Open Library. 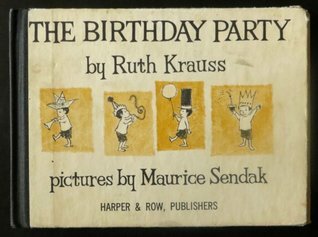 Krauss and Sendak have done several books together and this one is not their best, but it does share the charm of their other works. The main character is David, a boy who has been many places, but never to a birthday party. David wants "to have been to a birthday party," however, so he is thrilled when his family throws a surprise party for him. I love the concept of wanting "to have been to a birthday party" because it implies wanting to cross an experience off a list rather than to simply enjoy the experience for its own sake - something I think young kids feel fairly often. Sendak's illustrations are also spot-on. Even with very little text to suggest personality, David comes fully to life in those pictures.